As erythrocytes lack mitochondria they are not able to use fats or generate energy from Krebs cycle. Though they have enzymes to synthesize glycogen the balance between synthesis and breakdown favours breakdown. Normal erythrocytes do not have glycogen and depend on a continuous supply of glucose to meet their energy requirements. Glucose enters the erythrocyte freely by facilitated diffusion. Insulin does not have any effect on the entry of glucose into the erythrocyte. They erythrocyte metabolism needs ATP as a source of energy and NADH and NADPH cofactors. The erythrocyte does not synthesize nucleic acids but it has a small requirement for ribose to synthesize nucleosides for energy transfer The metabolic needs of erythrocytes are met by metabolism of glucose through three pathways glycolysis, the hexose monophosphate shunt and Rapport-Luebering glycolytic shunt. Glycolysis is a process in which one molecule of glucose is converted to two molecules of pyruvate with the a net formation of two ATP and two NADH molecules. The energy released in the process stored as ATP. The electron released in the conversion of glyceraldehyde-3-phosophate to 1,3-bisphosphoglycerate is accepted by NAD+. Glycolysis can not proceed in the absence of an electron acceptor. NADH produced by glycolysis is transported to the mitochondria where it generates a net of 2 ATPs (3 ATP are generated but one is consumed to transport NADH into the mitochondria). Erythrocytes do not have mitochondria. Methaemoglobin reductase is the only sink for NADH. Glycolysis can proceed only if NAD+ is regenerated. Conversion of pyruvate to lactate by lactate dehydrogenase regenerates NAD+ allowing glycolysis. The end product of glycolysis in erythrocytes is lactate. The main functions of the erythrocyte to deliver oxygen to peripheral tissue. Anaemia decreases the oxygen carrying capacity of blood. Oxygen delivery is maintained in anaemic patients by increasing blood flow and increasing the oxygen extraction (see pathophysiology of anaemia). Patients with anaemia have a decrease in the oxygen affinity of haemoglobin allowing a greater amount to be offloaded for a given PO2. 2,3-Bisphosphoglycerate (2,3-BPG) and H+ ions decrease the oxygen affinity of haemoglobin. The Rappaport-Luebering glycolytic shunt synthesizes 2,3-BPG from 1,2-BPG. The shunt bypasses an ATP producing. The erythrocyte pays for increased oxygen affinity as ATP. Erythrocytes are subjected to a high degree of oxidative stress from exposure to drugs and chemicals and from oxygen transport. The reactive oxygen species thus generated can affect cell visibility and function by conversion of ferrous iron of haemoglobin to ferric iron giving methaemoglobin. It can also damage lipid membranes shortening the erythrocyte lifespan. Glutathione is a tripeptide that scavenges reactive oxygen species and is oxidized in the process. Glutathione reductase regenerates glutathione by using NADPH as an electron donor. The only non-mitochondrial source of NADPH is the hexose monophosphate shunt. One molecule of glucose passing through the shunt gives two molecules of NADPH and is converted to ribulose-5-phosphate. The ribulose-5-phosphate can be converted to ribose-5-phosphate for nucleoside synthesis. It is also possible to generate 5 molecules of glucose-6-phosphate out of 6 molecules of ribulose-5-phosphate. This involves two enzymes transaldolase and transketolase both of which use thymine pyrophosphate as co-enzyme and are able to transfer carbon from one sugar to another. 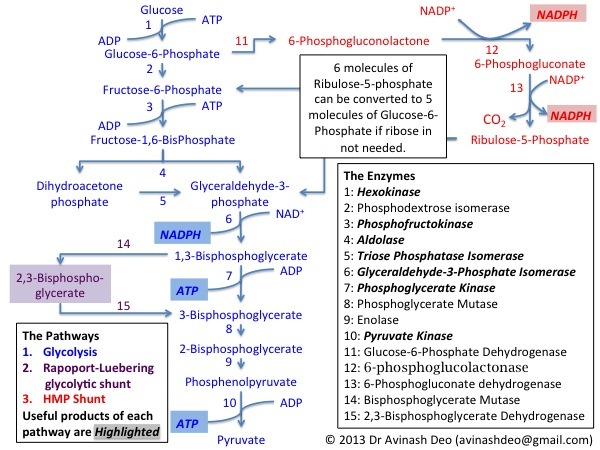 As the erythrocyte has only a small need of ribose it reconvert most of the ribulose-5-phosphate to glucose-6-phosphate. Normally about 10% of the glucose is metabolized through this shunt. When the erythrocyte is faced by an oxidizing stress almost 90% of the glucose may be metabolized through the shunt. The first and the rate limiting enzyme of the pathway is glucose-6-phosphate dehydrogenase (G6PD). G6PD deficiency is the commonest enzymatic deficiency causing haemolytic anaemia. It manifests as haemolysis in response to oxidative stress like exposure to drugs, chemicals of infection. The hexose monophosphate shunt is critical to the erythrocyte survival.